This is my third Tokyo Game Show, and this year it's the biggest the show has ever been, with a bustling indie game area, dedicated VR and eSports sections, and hall after hall hosting all of the biggest developers and publishers. 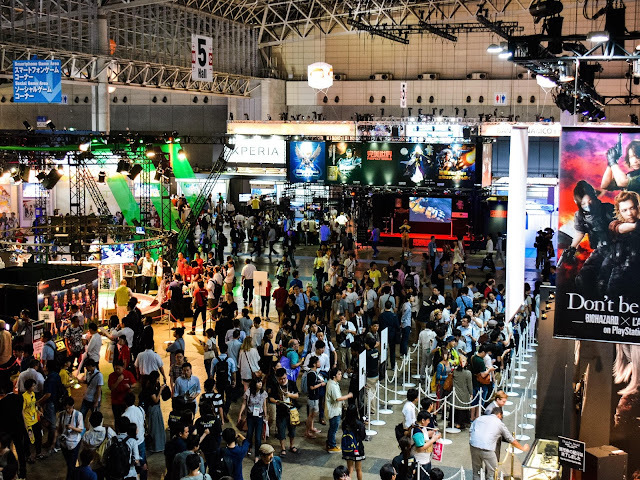 TGS is so large that the event is split into three different buildings; one occupies around ten halls, and plays host to the big publishers. This hall is all about grand displays and presentation as much as it is showing off games; the likes of Sony, Koei Tecmo, Capcom, Konami (yes, contrary to popular belief Konami still has quite a few franchises, even without Kojima), and Square Enix. Equally, though, this building is filled with the mobile and free-to-play developers that have been most successful over the years, or are looking to really drive promotion for their games. World of Tanks is the obvious one, and it spares no expense in what it does; as with last year the company has actually produced a manga to try and encourage Japanese players to engage with the game in a very Japanese way. The other use for these main halls is a couple of dedicated areas that I've liked for some time at TGS; there's a section dedicated to student projects and for schools/ universities to set up booths, and there's a section for emerging Asian nations to set up booths. TGS sees itself as the regional event; far more relevant to audiences and businesses from Thailand or Singapore than E3, for example, and the organisers of the show have done an excellent job in getting these (often) startup developers and game organisations to set up booths. The interest for these booths from a media perspective is perhaps limited; many of the game developers here don't have games of their own (they work contracts to build content for third parties), or if they do they're not as exciting as what Capcom's got going on in its booth, but if you want a long term view of trends in game development throughout Asia, this is the place you needed to be. Once again I came away from the show with a powerful impression that for many in Asia (including Japan, Korea, China, and Indonesia), there's less of an overpowering need to participate in western game industries now than there was before. With the advent of mobile and resurgence of PC gaming, there is a lot of money to be made in servicing regional markets, and in doing so these developers and publishers don't expose themselves to the kind of cultural criticisms that often come in releasing their games into the west. It's been a positive couple of years for us in the west with localisation, with so very many small localisation outfits popping up and doing excellent work. But there is an awful lot that goes untranslated, and never will, because there is no sense of urgency among many developers and publishers to look to global markets. The second building housed the shopping, indie section, and VR and eSports sections. Last year it was just the shopping and indies, and felt quite empty on the business days. With the additional interest sections, there was a lot more energy in the space this year around, and that was to everyone's benefit, I feel. The indie booth was impressively large this year, and had games in it from all over the world, and on a wide variety of platforms. Once again Sony was a sponsor of the area, with "PlayStation Loves Indies" flags everywhere. Sony also had the largest VR presence by far, showing the diverse range of investments that that company is making. As for the shopping; it was good fun as usual. There are generally some exclusive (or at least otherwise rare) goods for sale from the booths of the various publisher's merchandising arms. Square Enix sets up a booth for its music, for example, and always has some unique CDs that can only be purchased from TGS. Yes, I bought a couple of those. Koei Tecmo had a particularly good booth this year, which loads of Dead or Alive Xtreme 3 merchandise. I picked up a couple of tapestries for my home office - two of Marie Rose, and one of Hitomi. I have a good home office. There was also plenty of Danganronpa and Persona 5 stuff around. The third building was an entire area that had been converted into a food court. This was a good idea. Last year the food was in the same building as the indies, and it led to overcrowding by people simply looking to get lunch. I suspect on the (much) busier public days, on Saturday and Sunday, the flow of attendees will be far better this year. The atmosphere of TGS was, as always, superb. TGS is a very different kind of game show to most of the others - where PAX is a purely community-focused event, TGS has the business days. Where E3 is all about making big reveals, TGS is more subtle; it's about meetings and networking. Where western conventions in general have banned "booth babes", TGS utterly embraces them. In fact, I'd say that the costumes this year were the most daring I've seen a show, and I had to laugh when Sony Xperia put on a stunt in which they got two actual gravure models (gravure being swimwear or underwear modelling more about the sexiness of the model than what she's wearing), and had them sitting in tubs of water while being interviewed about random stuff. Why the stunt? I'm not entirely sure, but it did draw a big crowd. I know the booth girls thing is controversial for a lot of people, though I personally feel it adds to the fun and showiness of TGS. 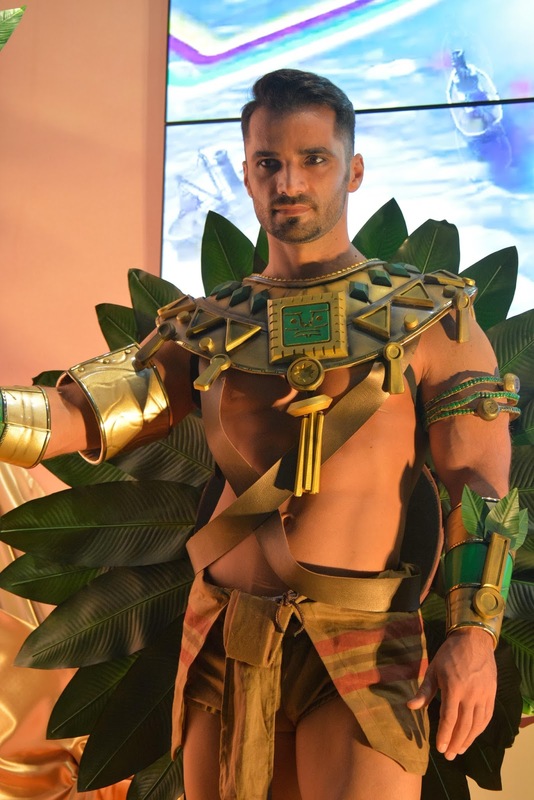 There were male models at some booths, including one that was just godlike in his bare-chested physique, and also a bunch of dressed up mascots because of course it makes sense to have a sheep walking around. Both men and mascots were completely outweighed by women in hotpants and bikinis, but the way everything is staged at TGS means that they're not really much different to the cosplayers that will come out in force for the public days. Most of my TGS events are filled in doing interviews and catching up with game developers, so my hands-on time with games is limited. I did get a brief play of Sonic Fire & Water (the less said about that game the better), and the new BlazBlue (a lot of fun!). 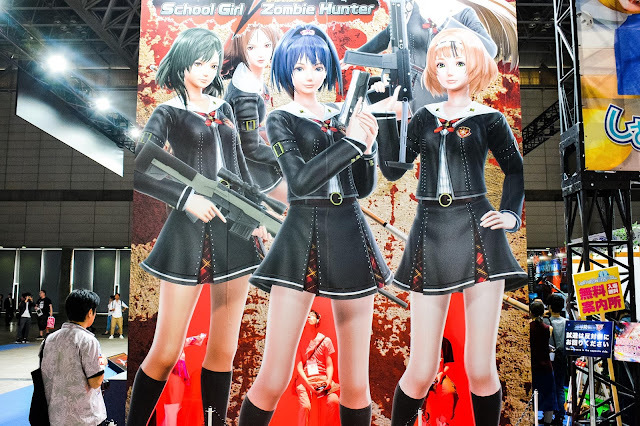 One game I did want to check out was School Girl Zombie Hunter, because it looks like a lot of grindhouse fun, but D3 likes to embarrass its players by setting up their booths in... interesting ways (see picture above), and I wasn't going to sit through that and risk getting photographed. So as an overview, TGS is off to a great start, and in the coming weeks I'm going to have some really fascinating stuff that came out of it to share. Stay tuned for more! Item Reviewed: DDNet in Japan #8: All about Tokyo Game Show, Day 1 9 out of 10 based on 10 ratings. 9 user reviews.